Ideal gift for art collectors and sport fans ! Original edition, only 3,000 pieces. NEW ! Binded book in protection envelope, 90 sides, approx. 0.95 kg, welded into protective plastic film, no ISBN number. Format approx. 25 x 31.5 cm. The book costs in the art trade (so far available): € 39.00. Book is no longer subject of fixed prices. Hans Borchert became well known through his perfect movement drawings. Sports such as gulf, soccer, tennis, but also the horse race sport are treated. Borchert sketched not only posters for large sporting events, but also worked with prominent athletes. 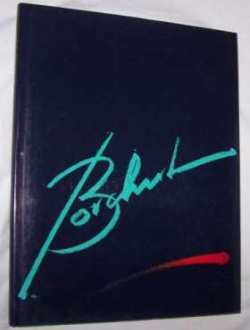 The cooperating with Lothar Matthaeus, Steffi Graf, Boris Becker and Bernhard Langer are documented in the book. Fig. "Gulf rotund II", 1994. Picture of Lothar Matthaeus (right side) and joint photos. Numerous tennis subjects, among others with Boris Becker (right side) and Steffi Graf. 1st inside: Hans Borchert, even portrait. Fig. "Gulf - red - blue III", 1994.